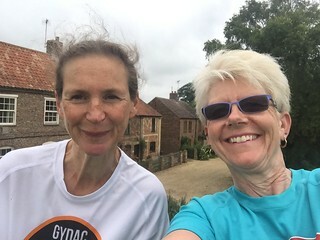 We caught the train to Downham market then came back along the Fen Rivers way, walking a mile, running a mile. It was an excellent route, the grass only too long for running in one small part, and thankfully not as wet as expected after a days rain. After about 8 miles we stopped at the Crown and Anchor for a pint before continuing on our way to the quay side in Kings Lynn.where we enjoyed fish and chips at Marriott’s warehouse. A total of 12 miles covered in 3 hours 3 mins at an avg pace of 14.42. An excellent day, we both found it much easier than just walking 12 miles, and I can see us doing some more run/walking in the future. Happy to say my Deuter Speedlite 5 pack was perfect for the job !! This entry was posted in Friends, Run/Walking on July 25, 2017 by Sally. Sounded good.and the fish and chips looked super. Even more kudos, running after a pint ! yes, Mick even I was impressed with that !!! !